Today, Universal Orlando Resort had its grand opening for Despicable Me: Minion Mayhem. The attraction has been in "Technical Rehearsals" since June 8. The grand opening featured a yellow carpet, dance music, and a mini parade. The attraction opened to an explosion of confetti. The celebrities in attendance were the actresses who voiced Margo, Edith, and Agnes; Miranda Cosgrove, Dana Gaier, and Elsie Kate Fisher respectively. Miranda Cosgrove will be back at Universal Studios Florida to cap off the Summer Concert Series on July 14th. The opening of Minion Mayhem marked the end of new attractions coming for the "Year to Be Here" which brought to Universal Orlando a new Blue Man Group show, two mini-golf courses, an updated Spider-Man, Cinematic Spectacular, and Superstar Parade. While the "Year to Be Here" has wrapped up, Universal is showing no signs of stopping. Recently, they have demolished the old Soundstage 44 building, and earlier in the year, they closed down and demolished Jaws and the surrounding Amity village. While the future of the Soundstage 44 plot is still unknown, permits confirm that the Jaws plot and parts of Lost Continent will be used as the expansion to the wildly successful Wizarding World of Harry Potter. 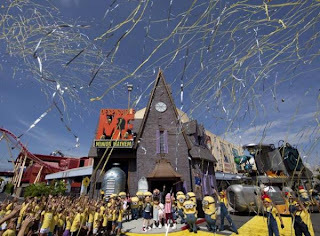 For more on Minion Mayhem and its grand opening we suggest checking out Orlando United and author of "Universal Orlando: The Ultimate Guide to the Ultimate Theme Park Adventure", Seth Kubersky.